A major factor for telemarketing is Telephonic and Fax operations. Hence, with this in mind, Leo Data Services furnishes Telephone and Fax Matching Service. Our phone and fax Matching services offer the best results and let you focus on your marketing strategies. Eventually, you will develop your business by using our tele and fax matching service. Leo Data Services completely focus on satisfying customers. Our team of highly skilled individuals, along with experienced executives and decision makers offer their time and expertise in order to give you the best service you deserve, which is our major concern. 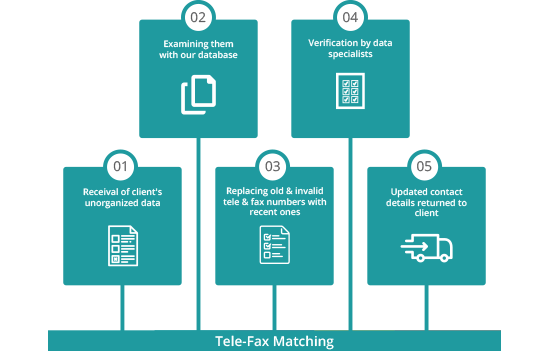 Why choose Telephone and Fax Matching Service from Leo Data Services? Leo Data Services are the leading Telephone and Fax Matching Service providers in the industry. When it comes to experience, none can match up to the level which we are in right now. We are currently partnered with many businesses across the globe which includes the USA, Canada, UK, Japan, and so on. Marketers who use our list corroborate and encourage us to move forward. The reason being our service, which is considered to be the best in the industry. Make the right decision by investing in our service for better a business. What is the advantage of Telephone And Fax Matching Service? If you want to expand the opportunities for your marketing campaigns then we have the perfect tools for you. Our services optimize your existing data lists and make them all the more useful. By availing our services regarding telephone number and fax number updating, you will expand the advertising boundaries for your business. In short, your broadcasts can now be carried through multiple modes. An enhancement of brand visibility and thereby, lead generation will soon follow.